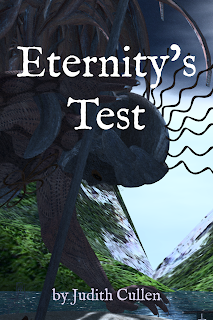 ETERNITY'S TEST is now available on Amazon! What started out as a simple request from a colleague turned out to be an incredible journey. I had the spark of an idea immediately when Eleseren Brianna (aka Donna Kantaris) invited me to write a companion piece to her own short story, written in support of an installation of 2D and 3D virtual art, "The Curio." She specifically ask me to do a story from the perspective of the colossal stone and metal "Enkeli" figure that she had created and spun a story about. "Enkeli" is the Finnish word for angel. How does and angel end up in the wilderness, as the one in Eles' story does? And what could that mean? Research, followed by several weeks of brooding contemplation amidst the turmoil that was last fall's U.S. presidential campaign followed, and in the aftermath this story came flowing out like an emotional imperative. After letting it steep and revise, it still has that imperative feel about it, which lead to me deciding to publish it as a stand alone story, instead of tucking it into another collection. It deserves its own focus. Not everyone likes ir reads Kindle, I understand that. but I am offering a special deal for folks on my mailing list, so if you are brave enough to READ MY NEWSLETTER announcement of this release, you can take advantage of the deal offered my subscribers! 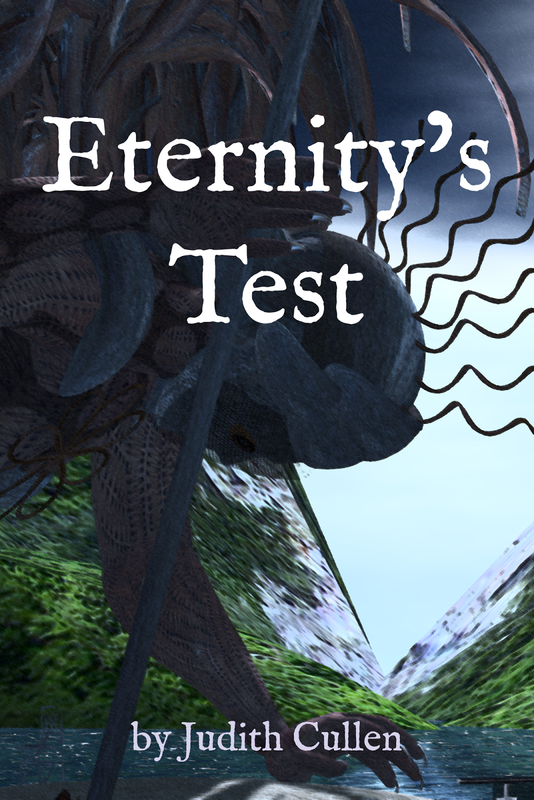 If you enjoy it, don't forget to leave a review of Eternity's Test on Amazon. Every little bit helps! Coming in July and August - several event appearances, and more short stories. With all the things going on in the world, and in my life these days, I have decided to release December's story of a near fallen angel and the lessons he learns encased in stone and metal in the wilderness over millennia. It seems like just the right thing to do. So, keep an eye out for ETERNITY'S TEST to be released this month in Kindle only through Amazon as a stand-alone piece of short fiction. The time has come: be ready! For those of you who read the original last year, you may remember that this story was inspired by a virtual world sculpture by Eleseren Brianna (Donna Kantaris). She also write a story about "The Curio" in which some 19th Century vacationers come upon its compelling presence deep in the Scandinavian wilderness. Her story was very much one of observation and supposition, done in the format of a 19th C diary. She asked me to consider creating a story from the sculpture's point of view. And that, as we say, is that! More coming, so stay tuned!